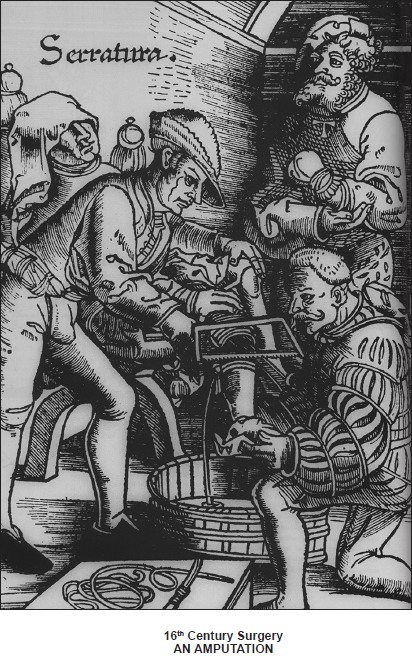 The first picture of an amputation, a woodcut from Feldtbuch der Wundartzney (the fieldbook of wound surgery) by Hans von Gersdorf, 1517. The patient is blindfolded so that he cannot see what is going on. "How dare you teach me surgery," wrote Pare, the greatest surgeon of his age, in answer to a critic, "you who have done nothing all your life but look at books. Surgery is learned with the hand and the eye. And you - mon petit maître - all you know is how to talk your head off, sitting comfortably in your chair". "Knowing that boiling oil was sure to cause the wounded terrible pain, before applying it I asked what the other surgeons used for the first dressing. It was only when I learned that they oured the oil as hot as possible ino the wound that I summoned up enough courage to do likewise. But then I ran out of oil and was obliged to apply a mixture of egg yolk, oil of roses, and turpentine. That night I was unable to sleep thinking I was going to find that my wounded patients had died because I had not performed the cauterization with boiling oil. So I got up before daybreak and went to have a look at them.What I found was beyond my wildest hope, for those to whom I had given my mixture felt little pain and their wounds were not inflamed. On the other hand, I discovered that all those to whom I had administered the boiling boiling oil were in dreadful pain and with the injured part inflamed. At this I decided that never again would I burn so cruelly the poor men who had been wounded by arquebus shots."